We went to the Nihon Sumo Kyokai Official Grand Sumo tournament for the 2nd day of competition in Ryogoku, Tokyo. Initially quite baffling, personally I thought this was an instant highlight of the trip so far – the rather curious ceremony surrounding the bouts and the grandeur of the Ryogoku Kokugikan were steeped in atmosphere and energy. Lines of spectators were gathered outside to greet the Sumo’s as they walked into the Kokugikan (polaroid to follow!) and the Sumos themselves were extremely impressive – I was getting used to being taller than most people here. The spectators sat along the first few rows of the dohyō seemed to be surprisingly brave to say that more than once we saw a Sumo go flying into the first row. Mostly we had to judge how good each wrestler was by how the crowd cheered as they got up to the dohyō; the biggest cheer was reserved for the final fight of the Juryo stage – where Yamamotoyama destroyed Kasuganishiki. 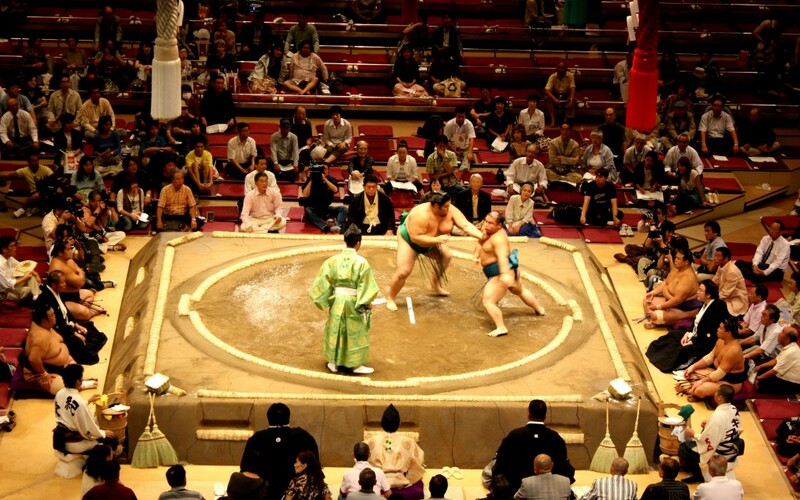 Some of the matches were surprisingly brutal, at least one Sumo had trouble hobbling back into the ring to bow!